*This dressing is spicy!! We like heat in this house. If you do not like spicy dressings, I'd advise using less chipotle peppers and more avocado oil and cilantro, and perhaps add more maple syrup. 1. Wash and chop the kale. "Massage" the kale with the lemon juice - just rub the kale with your fingers. This helps break it down and makes it 1) taste better and 2) digest easier. 2. Wash and chop the romaine and add it to the kale. 3. Chop your sweet potatoes, toss with avocado oil, and roast on a pan in the oven at 450 F for about 15-20 minutes. Once they are done, remove from pan and allow to cool a bit. 4. While the potatoes are roasting, cut your sausage into thin slices and cook over medium heat on the stove until they are cooked through and well browned. Remove from heat and dab with paper towels if necessary, as chorizo is often quite greasy when cooked. 5. Dice up your bell pepper, hard-boiled eggs, cilantro, and avocado. 6. Add all of the ingredients for the dressing in a blender or food processor and pulse until the chipotle peppers are fully blended in. 7. 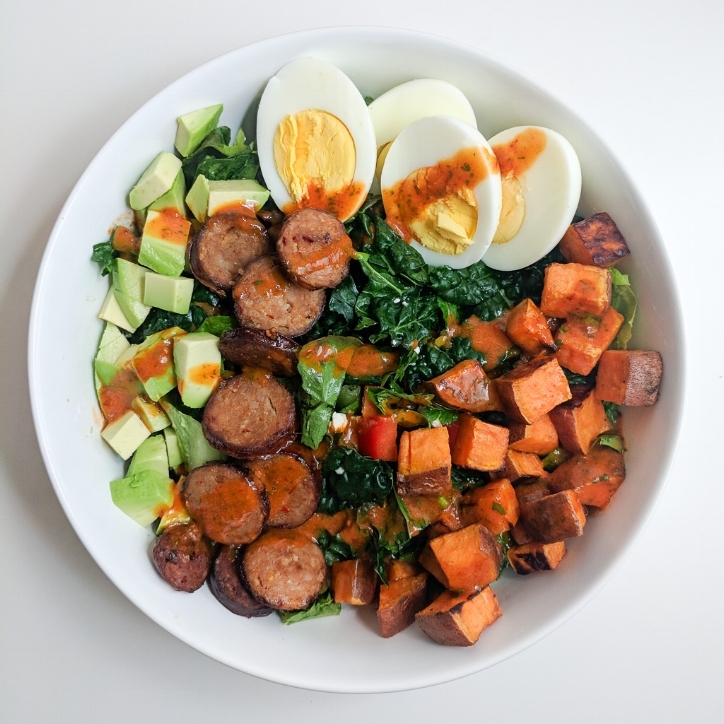 You may either toss all ingredients together with the dressing and serve, or you may assemble the salad "cobb" style by placing the lettuce and kale down and forming rows of each ingredient along the top of the salad. I did a little of both, as seen in the photos. Top with the dressing and enjoy!